End tables are essential to a living room. They not only add to the function by storing and providing a tabletop surface – but they define the structure of the living room and add beauty. We needed end tables for our living room. I love our Rustic X End Table plans, but the substantial overhangs of the tops would be a hazard for our 9 month old baby. I spotted some similar living room tables in a catalog, without the overhangs – but the set would cost over $1600! So I decided to DIY my own end tables. We ended up building a console table with desk bridge (plans in the works) and a end table. The two tables transformed our living room! Not only does the space function much better, but it just looks so much better now! And there’s a good amount of storage now, both hidden and not. We love love love it all! The farmhouse end table is maybe my most favorite! It’s the perfect size, the perfect height, and the perfect mix of rustic and modern. 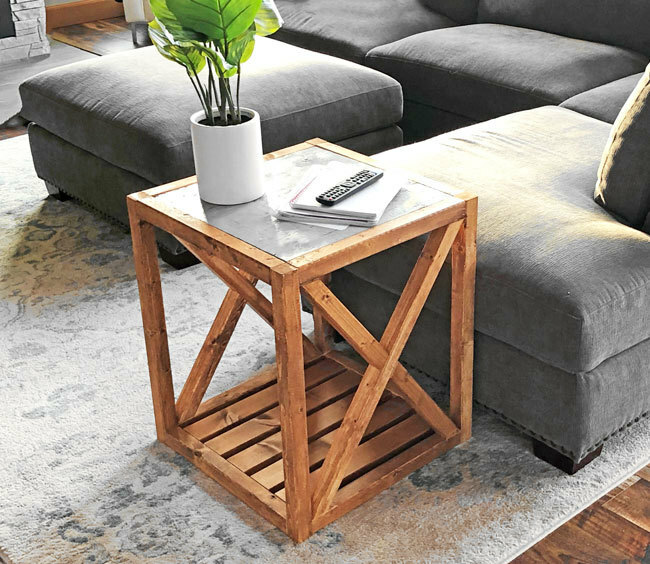 It’s so sturdy – we find ourselves moving it all around the living room to use for playing cards or board games or serving food and drinks off of. We spent about $20 building it – yup, TWENTY BUCKS for this beautiful farmhouse end table! What a bargain! The plans are following, please share if you build, we love seeing your projects! It’s a big deal! PS – We’ve added plans for the Modern Rustic X Console Table here!